Ms Lord said she had not seen any turtles on the road when she cycled home on Thursday, but was confronted by the dead long-necked turtles on Friday, October 3. ‘It was really horrible, they obviously hadn’t died a nice death, their shells were smashed and it was quite horrific really,’ Ms Lord said. City of Stirling Parks and Reserves manager Ian Hunter said female western long-necked turtles normally leave wetlands at this time of the year in search of soft sandy areas above the usual high water level to lay their eggs. Mr Hunter said the grass-covered spaces of parks and playing fields found near the City’s wetlands was impenetrable for the turtles looking to bury their eggs. ‘This occasionally means they attempt to cross busy roads in search of suitable areas, typically in landscaped street medians or garden beds in private properties,’ Mr Hunter said. 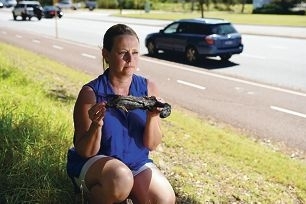 Ms Lord said she thought it was important for motorists to be mindful of Perth’s native wildlife during spring. ‘I don’t profess to be an expert, but I just saw them and I thought if we could get a message out and if people knew, maybe they’d slow down a bit and be aware that we’re kind of sharing the roads with other creatures and perhaps try not to run them over,’ she said. Mr Hunter said the City had installed wildlife crossing signs some time ago in the area and encouraged drivers to keep an eye out for animals. He said anyone finding turtles can assist by picking them up and carrying them back to their nearest wetland.